A joint venture mixed-use multi-residential development by Assemble, Wulff Projects and Icon Co in Melbourne’s Clifton Hill is using a collaborative design approach to deliver sustainable, small-footprint living. The 122 Roseneath St development will comprise 49 apartments and 18 townhouses designed around flexible shared spaces, including a multi-purpose workshop and a communal room with an adjoining north-facing terrace that can be used for dining and entertaining. “With thoughtful integration of communal areas, we’ve designed a place where collective culture can thrive,” Wulff Projects director Adam Wulff said. A sustained period of community consultation was carried out as part of the design process. This included consulting potential residents on the functions for the communal room and terrace, the type of ground floor retail tenancy, car park demand, pet-friendly owners corporation rules and sustainability features, including external operable shutters, an embedded energy network and a shared composting facility. Assemble director Ben Keck said the team were “spurred to action by the increasing absence of well-designed housing in Australian cities”. Mr Keck said all three development partners have a shared belief in small footprint living. “Living small is not just about size; it’s a way of life that treads lightly on the planet and fosters community, helping our city grow more sustainably,” he said. The design brief for the dwelling interiors also includes flexibility, with buyers having the option of extras such as adding a children’s baths beneath the shower, provision for a pet door or an “arrival station” by the door to drop off coats, keys and shoes on the way in. “A customisable approach will allow residents to personalise their space and allocate their budget to what’s most important to them,” Icon Co director Ashley Murdoch said. The development will also feature two raised linear parks with drought-resistant native landscaping that will intercept the three six-storey apartment buildings. On the ground floor, a retail tenancy space is planned. The team said they drew on the Nightingale model in approaching the project, and just like Nightingale 2.0, they came across an issue with parking. Icon Co development manager Kyle Reeve said 23 per cent of the people who registered and confirmed their interest in the project said they did not want a car. “We were keen to reduce the amount of car parking in line with this feedback, particularly for the studio and one-bedroom apartments, however neighbours and council expressed concern about car parking and in response we decided on the provision of 66 car spaces, equating to a one-for-one ratio with the number of units,” Mr Reeve said. He said the plans also include approximately 60 secure bike parks in the project, 12 more on-street for the retail tenancy and visitors, and two scooter or motorbike parks. There is no provision for share cars, however there are several in the immediate neighbourhood, he said. 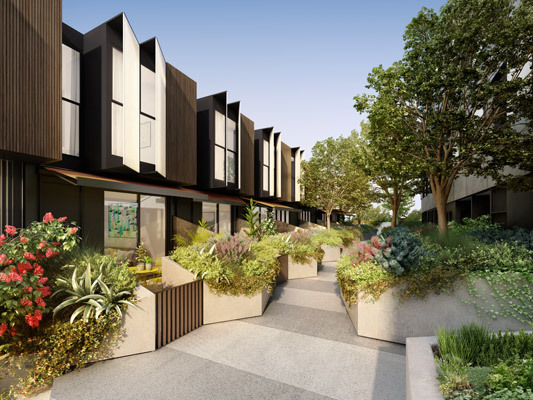 The development is also within walking distance of Clifton Hill railway station and has connectivity to the Merri Creek cycleways that connect directly to the Yarra River and Federation Square. Mr Wulff said the community consultation paid off in terms of getting project approvals in place. The process of early engagement, with the local community consulted at key stages of the design process for feedback, resulted in design adjustments including reducing the overall number of townhouses and increasing setbacks in certain areas as a trade-off for increased height in less sensitive areas. This process led to a positive result at the council Internal Development Approval’s Committee meeting, he said. Mr Wulff said the project is targeting an average 6.5-star NatHERS energy rating for all the dwellings, a building envelope that exceeds NCC energy efficiency standards and a design that exceeds the City of Yarra STEPS guidelines. Sustainability elements being incorporated include solar panels to provide renewable energy for common areas, and an embedded energy network through which residents can source green energy from the main grid. Mr Keck said the dwellings would also have external, manually operated shutters to allow residents to control the amount of heat and glare from the sun and reduce reliance on airconditioning, high performance double glazing and insulation, and wide frontages for natural light and ventilation. Interior finishes will be low-VOC for improved indoor environment quality, and rainwater harvesting will supply water for landscape irrigation, the communal workshop and several of the development’s toilets. Mr Reeve said that while the development had not yet entered the sales phase, the team had been “overwhelmed with the support from potential residents who have registered their interest and participated in the stage one design presentations”. The development is expected to be completed in 2017. A fabulous project. Truly a step in the right direction. Talking about steps – without a full set of plans I’m only able to comment from the street render – some fairly imposing stair approaches – these may be daunting for people with disability, or visitors needing to traverse through the site.